Discover the RBC Direct Investing platform for DIY investors. When looking for a discount broker, it’s not just about the transaction fees, learn everything you need to know about the platform to invest with success. RBC Direct Investing is a strong platform with competitive offerings. After 4 years with RBC Direct Investing, I am still pleased with the platform and the service. I initially made the switch from Scotia iTrade due to the lack of a true USD account and the fees for holding such account. The process was quite simple but it does take a bit of time for everything to be transferred. During the process, I happen to receive dividends 3 times with one of them repurchasing one share. I was a bit worried I would have to fill out the forms again but luckily, after notifying RBC Direct Investing through the secured message systems, they were able to easily transfer the shares and money every single time. It was quite a pleasure dealing with their service through the secure messaging system on their website. There is nothing better than learning from others and their experiences. In the case of RBC Direct Investing, I can share my experience but I have also gotten feedback from readers. One great option from RBC Direct Investing is the RBC practice account – a no-risk approach to trying the platform. 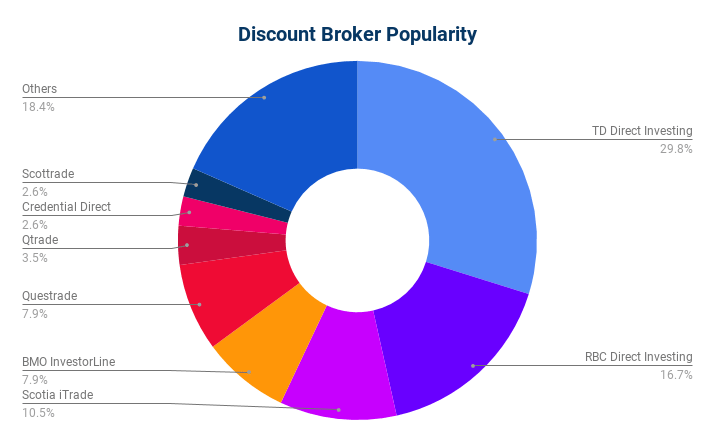 The cost of using a discount broker is probably the most important factor to every DIY investor in order to keep the cost down. My approach has been to assess my trading cost per $1,000 invested with a goal to keep it at or under 1%. The cost of a transaction is in line with all the other bank-owned discount brokers with a $9.95 rate per transaction. It’s a 1% fee on a $1,000 investment which I consider acceptable. In fact, if you want to use DLR to exchange USD for CAD dollars (or vice versa), you spend a minimum of $20 for the currency exchange. RBC now allows its customers to pay with RBC Reward points for trades which is an innovative way to leverage all the benefits the bank provides. $9.95 seem to be an acceptable trading cost investors are happy to pay but there could always be room for improvements. I would say that it is a balance between a transaction fee and an account fee. Which one would you prefer as a consumer? If you trade more than 150 times per quarter, the transaction fee is $6.95 per trade while you maintain the number of transactions per quarter. For more details on the RBC Direct Investing fees, see the formal rates from their website. Like many of the other discount brokers, there are no fees on mutual fund transactions outside of the fees paid within the funds referred to as MER. If you hold mutual funds such as RBC Monthly Income Fund, your only concern is the MER. If you buy ETFs, you will be subject to the same transaction fees as a stock trade. Comments can be conflicting depending on the perception or expectation of the investor. There are many important factors to be aware of about accounts with a discount broker and you should be aware of the details based on your needs. Your needs may also change over time and if that’s the case, don’t hesitate to adjust. You can start the account sign up process online but you may have to submit it by mail with a signature. If you are an RBC client it should be quick and smooth, but as a non-RBC client, you may need to sign documents on paper. All in all, don’t expect to open an account at 10 pm at night, fund it an hour later and make a trade the next day. Your hot stock tip will have to wait … It can take a week until you are set up. If you intend to transfer accounts from another financial institution, that’s a separate form from the signup process. If you transfer more than $15,000, RBC will cover up to $135 in transfer fees from another institution. The process of adding money to a trading account is actually critical. You don’t want to wait too long before you can make a trade. When it comes to RBC, and all bank-owned discount brokers, the easiest way is to have a bank account to transfer money to and from. The best option if you don’t bank with RBC is to use the bill payee approach to transfer cash from another financial institution. 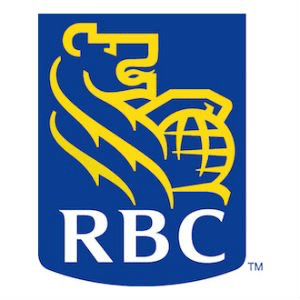 Simply add RBC Direct Investing as a bill payee through their online banking site. This is the best option for all non-bank owned discount brokers. The US and CDN accounts with RBC Direct Investing are working just like you would expect. There is a separate account in the currency for each type of accounts. The currency management per accounts works without paying extra fees or exchange rate to make a transaction within the account. As a Canadian, my diversification is mostly towards the US with the large conglomerates dividend growth stocks providing me with my international exposure. I wanted to avoid currency exchange when trading as much as I could since it’s really painful to control and the cost can add up. With 43% of my holdings in US$, that’s an important feature to have for me as I also DRIP in the currency of the dividend stocks. The holding tab provides a nice at a glance view of all my account summary with a different line per currency and a total in each currency including my cash holding in the currency. The latter was a pet peeve of me with Scotia iTrade as it was painful to really know how much cash I had in each currency. Every now and again I had to top up due to miscalculation and it was frustrating. 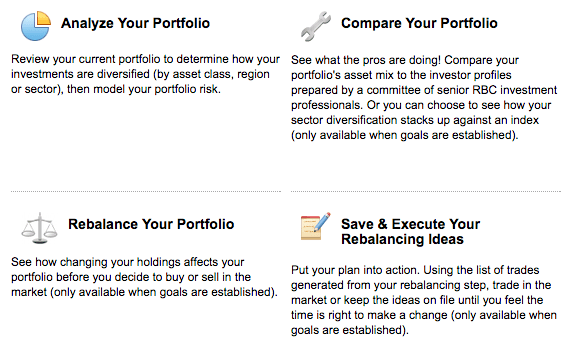 Otherwise, there is a performance tab section allowing you to see your portfolio by quarters or annually and compare it with an index. Below is what it looks like. The asset allocation and model portfolio are a nice touch but it’s mostly setup towards mutual funds investor. There is good education section for new investors to get started. I thought it was good to teach about the tools but it’s catered to lead you towards RBC mutual funds. The website is pretty intuitive and easy to use from my point of view. It originally was old school but it is evolving into web 2.0. It still has some progress to make but it’s moving in the right direction. The improvements are around the information displayed such as performance or the details on an account. The experience is similar to the other brokers I have used which include Scotia iTrade, e*Trade US, and Scotia McLeod (prior to Scotia iTrade). I tend to trade with a limit for buy and sell orders so I don’t need much. The trade settlement timeline is pretty much the same as what I had with Scotia iTrade and e*Trade; it approximate to 3 days. RBC offers a practice account so it’s really easy to actually see for yourself if it works for you. The research is mostly focused on economic data and that’s not really my cup of tea. Scotia iTrade had some nice reports with their ratings and recommendation that I liked. RBC happens to have something similar that I can access daily but the format is quite hard to read from an at a glance perspective. I have also seen the TD Waterhouse reports and they are in line with Scotia iTrade. I would love to have the equivalent of the competitors but I knew that going in. I’ll have to live with it. I would say the research is not on par with TD Direct Investing or Scotia iTrade. 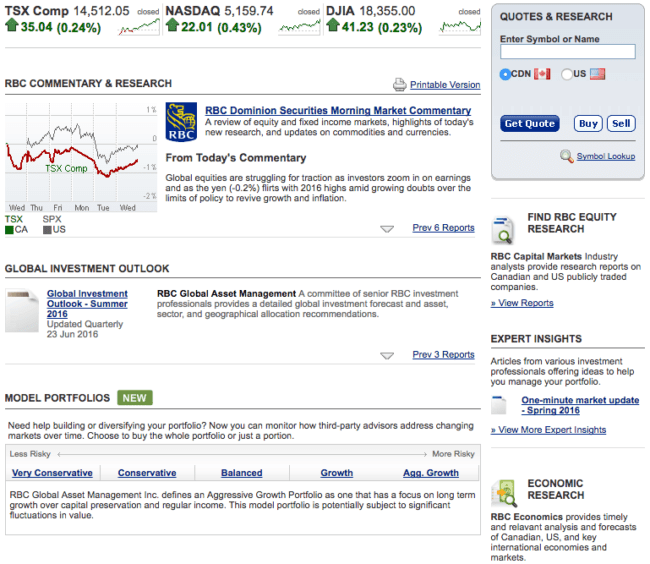 I was expecting RBC Direct Investing research and analysis but they are all external research from Standard & Poor. It’s acceptable for US companies with their 5-star ratings but it’s not as good as Canadian companies. I was very pleased with the customer service. I live in the computer age so I try to do everything on the web through email and only call as a last resort. They answered all my questions with detailed information for me to proceed with different tasks. The secured email service works really well and I use it from time to time. It takes at least 24 hours to get an answer so if you have an urgent request, it’s better to call. I happen to also open an RESP account as I am moving it away from the mutual funds where it currently is and they were helpful in filling out the forms as well. They even called me to walk me through some information I had missing. My experience with RBC Direct Investing has been great between transferring my holdings and making transactions in CAD and US dollars. The transfer from another discount broker was just simply easy. I got all the shares transferred in kind by filling the forms. I kept them up-to-date through the secure messaging system on their website of all the dividends I was receiving at the time and they responded quickly. Three times in fact. I had to pay fees to transfer a couple of accounts and RBC Direct Investing kindly refunded me back the fees simply by faxing them the monthly statement. During the transfer, some of the book values or ACB (Adjusted Cost Basis) weren’t transferred and I was able to let them know of my original ACB for performance tracking. It was really nice to be able to do that as I can rely on the data for my performance tracking.